ACLU Sues Trump And ICE Over Migrant Conditions - Joe.My.God. The American Civil Liberties Union and two other groups are alleging in a lawsuit that illegal immigrants being held in a California federal prison are being denied their constitutional rights. The ACLU filed the lawsuit against the Trump administration alongside civil rights groups the Prison Law Office and Civil Rights Education and Enforcement Center, arguing that the immigrants are being denied basic food, health care and religious freedom. “The federal government is needlessly locking these individuals into a medium-security federal prison, and is depriving them of basic human needs such as health care, food, and sunlight,” said Margot Mendelson, a staff attorney at the Prison Law Office, in a statement. 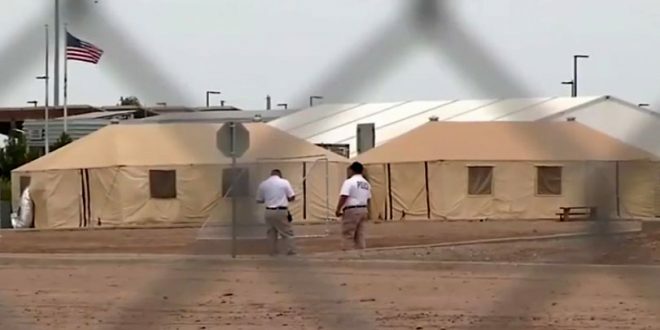 The groups argue in the court filing that the the Trump administration “manufactured a ‘crisis’ of insufficient bed space to detain immigrants.” This led Immigration and Customs Enforcement (ICE) to move more than 1,000 illegal immigrants to the prison since June 8, 2018.